In our digital imaging class, we were assigned to photograph the whole alphabet in two forms, one typographical from signs, billboards etc. and the other from found environmental items. We then had to make a Photoshop layout for each. It was interesting to focus on all the different varieties of typography out there and also to search for “letters” within the shapes and forms all around us every day. Below is my completed layout for the typographical letters. 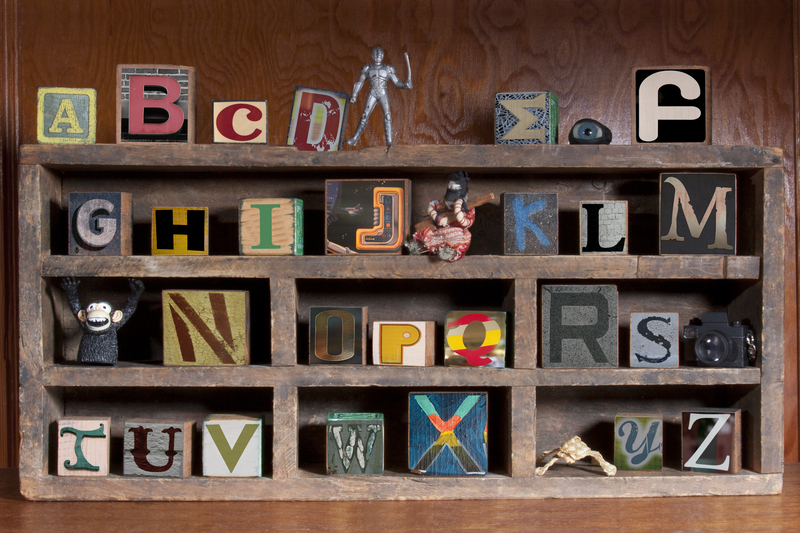 I composited alphabet blocks on a shelf then put the photos of the letters on them. This entry was posted in Digital Imaging Class and tagged alphabet, composite, digital imaging, eric waters, letters, photoshop, student work, typography. Bookmark the permalink. Nice job on the alphabet assignment! Your idea was really creative and it’s awesome. Eric, this is genius! I love the old, rustic feel it has to it and it looks like it belongs in an “I Spy” book. Definitely my favorite out of the ones I’ve seen so far. Great job! I agree with Holly, it looks like it came out of an I Spy book. Very creative. This is a very cool concept. I like the antique feel. Great work Eric. I love the design and the composition. I love this one! I love how you composited the blocks as well as the letters – you put a lot of thought into this and used your instincts and abilities well. Great job!